Sherri, a genealogist and friend from Topeka, inspired me today to repost this. One of her African American ancestors, who lived during the civil war era, has a military headstone but yet no records have been located to support his military participation. The headstone was placed in error, or by descendants based on family stories. This is a common. Even in Lyons Kansas my grandfather has a permanent WWI placard placed on his "resting place." Yet, he didn't serve one day in the military due to a physical deformity. Records are harder to obtain for African American soldiers who served with Confederate troops, and for ex-slaves prior to the Civil War. But might I add, not impossible. Many African Americans served under alias names (or changed their names) after serving, making tracing them more difficult. Alias surnames and new given names were actually adopted, especially for slaves during the Civil War. The common belief is that the "surname" of slaves changed with new slave masters, but this actually should be taken as a possibility, but not a rule. During the Civil War, slaves were often substituted to serve for their master or an arrangement was made for them to serve for another. This was common practice for southerners to meet a requirement of military service and they could do it with as little as the promise of freedom upon return. If an agreement was made by the slave-master to "rent" out a slave to do military service for another often the slave used the surname for whom they were fighting during their military service of the Civil War. Sometimes, this was a temporary name change. As in the case of Nelson Strader, discussed below, many returned to their former master's name after the war. This was all possible because after the Civil War ex-slaves could choose whatever name they wanted. Willis Mills became Willis Cox, Nelson Mason became Nelson Strader and Minor Wair (Weir) became Minor Underwood. What do they all have in common? They were ex-slaves. And, besides legal marriages, legitimacy of children, and access to land titles, after the Civil War ex-slaves were allowed to choose their own surnames. It is thought that slaves held on to their slave master names, but actually only about fifteen percent did so. The others chose surnames of a previous slave master or the surname of a famous person. Often slave children separated from their parents may have, after emancipation, taken the surname of a parent’s master, as did Wills (Mills) Cox. Even other’s were purchased for the purpose to fight in the Civil War and were promised freedom after their service. Many of them adopted the surname of their emancipator, or as did Nelson (Mason) Strader who returned to the surname of his former master upon completion of his Civil War duties. 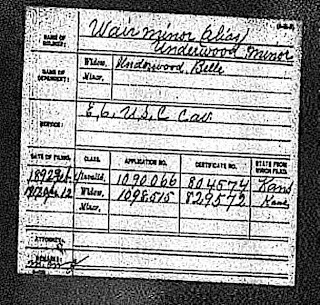 And, others just chose a surname that they liked, as did Minor (Wair/Weir) Underwood. Minor was purchased by William Weir to take fight in his stead, and upon completion of the agreement and the end of the civil war, he embraced the name Underwood once he arrived in Kansas with the Exodusters. His original slave master was not Underwood, nor was he ever owned by an Underwood. 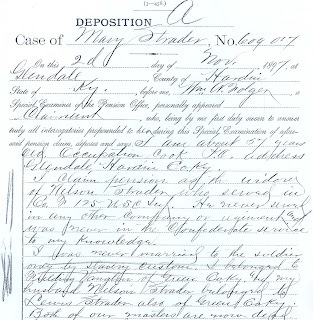 The details of an ex-slave's name change are most often found in Civil War pension records. Excellent report. Thank you for sharing. This did clear some misconceptions I had. I appreciate it. Just wanted to let you know that I thought this was very interesting. I always assumed that they took the name of the current master. 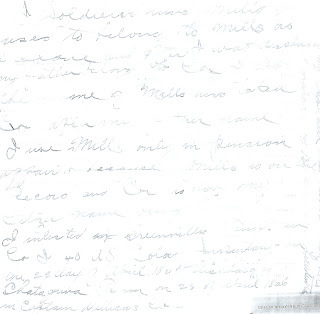 The issue of name change is one of the most confounding challenges that I have faced while researching my ancestors. When I get to the 1870 Censuses, things slow down and I'm stuck until I figure out whether my family members were slaves, who owned them and whether they were a product of relations between the slave and slave master. Allegedly, my surname Gregory, was taken from the slave owner. So I'm told. Am I really a Gregory? And if not, what is my real surname? Its very interesting and fuels my curiosity to know more about the origins of my ancestors. Thank you for this post, it is an eye opener!